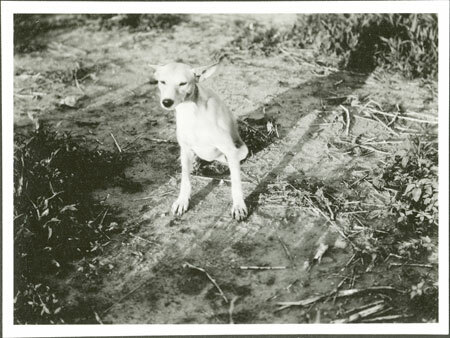 A portrait of a Nuer dog, with tawny coloured fur markings known as mayan in cattle. The Nuer used dogs in the small amount of hunting which they undertook mostly in the dry season, chasing game such as Gazelles until they were tired after which spearing would finish the animal off. Note on print reverse ms pencil - "09"
Morton, Chris. "Nuer dog" Southern Sudan Project (in development). 03 Jan. 2006. Pitt Rivers Museum. <http://southernsudan.prm.ox.ac.uk/details/1998.346.19.2/>.